Advent has changed the out look of physicians about power of drugs over diseases. Importance is magnified in developing countries, as infectious diseases are present predominantly. Chemotherapy refers to the treatment of diseases by chemicals that kill the cells, specifically those of micro-organisms or cancer cells. If directed against cancer cells, we label it as cancer chemotherapy. If directed against micro-organisms, we call it antibiotics. Antibiotics are the natural substances produced by micro-organisms that kill or inhibit the growth of other micro-organisms. They are used in low concentration. This definition excludes all substances produced by higher forms of organisms, like antibodies, and excludes those substances produced by micro-organisms but required in higher concentration to inhibit the growth of micro-organisms. E.g. ethanol, leptic acid, H2O2, etc. 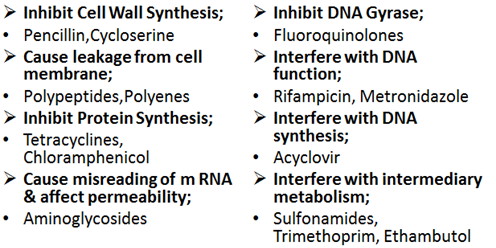 Drugs in this class differ from all others since they are designed to specifically inhibit or suppress the infecting organism, without producing damage to recipient. Drugs in this class differ from all others. Moldy curd was used by Chinese for treating boils. Chenopodium was used by Aztecs (Mexicans) for intestinal worms. Mercury was used by Paracelsus for syphilis, he is known as father of chemical chemotherapy. Cinchona Bark has been used since ancient times for treating fever. The phenomenon of antibiosis was introduced by Pasteur in 1877. He showed growth of anthrax bacilli in urine was inhibited by air borne bacteria. The term Chemotherapy was first used by Ehrlich since he used substances of known chemical structure and showed that selective attenuation of affecting parasite was practical. Ushered by scientist Domagk. He demonstrated therapeutic importance of Prontosil (sulfonamide) which was sulphonamide dye used in pyogenic infections. First sulfonamide by name of Sulfapyradine – 1938. Chain & Florey carried on the work and Clinical Use of Penicillin was started in 1941. Its commercial manufacture started in 1940s because of great potential in war wounds. Waksman & colleagues undertook research of Actinomycetes as source of antibiotics and aminoglycosides. Streptomycin comes into being in 1944 produced by Streptomycetes. This group of Soil-microbes proved to be a treasure house of many antibiotics and soon Chloramphenicol, tetracyclines and erythromycin were discovered. In past 40 years emphasis has shifted from searching for new antibiotic producing organisms to semi-synthetic and synthetic derivatives of older antibiotics. They are said to have less adverse effects and more desirable properties. Synthetic antimicrobial agents like fluroquinolones and oxazolidinone have come up. Prescriber should clearly identify whether there is need of chemotherapy or not, because some infections like sore throat, common cold have viral origin and hence there is no role of antibiotics. They themselves subside in 5-7 days if defense mechanisms are good enough. Symptomatic measures will help. Selection of drugs is based on cost effectiveness of drug, the safety and toxicity. We have targeted chemotherapy and empirical chemotherapy. In targeted chemotherapy specific treatment is carried out based on culture sensitivity report. However facilities for culture sensitivity are not always available. Empirical chemotherapy is based upon clinical practice, the experience of doctor, the epidemiological pattern of disease, extent of disease in community. We take the specimen for culture but start treatment at the same time. Usually treatment is initiated with narrow spectrum drugs, however, in life threatening situations we start with broad spectrum antibiotics. “Minimum concentration of antibiotic required to suppress growth of micro-organisms or to achieve therapeutic effect”. Route of administration is such that MIC is achieved and the drug reaches the site of action. E.g. aminoglycosides like streptomycin if given orally, it is ineffective (a polar compound). Drugs which cannot cross BBB can be given by intrathecal route of administration. However nowadays intrathecal administration can produce neurotoxicity so drugs like penicillin in meningitis are given I/V in massive doses. In this way desired concentration is achieved. Most drugs are continued for more than 48 hours even after symptoms subside. In certain chronic diseases like tuberculosis, treatment is continued for 6-8 months and in leprosy treatment is given for one year. Monotherapy is better tolerated. It is cost effective and chances of drug interactions are less. There are certain conditions where there is no concept of monotherapy, e.g. tuberculosis. There can be decreased toxicity if two drugs are combined. They have synergistic action, as lesser dose of individual drugs is required. Frequent change of drug is not a good practice. Enough time should be given to a drug so that it get absorbed, reaches the site of action and produces pharmacological effects. 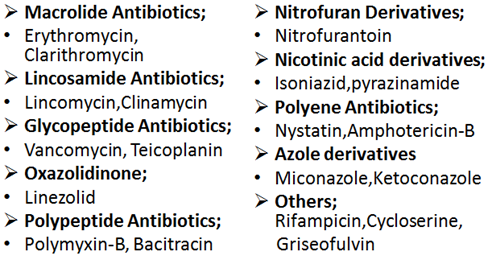 Sometimes barriers like presence of pus or necrotic tissue can decrease the effectiveness of antibiotics. E.g. drainage of pus makes treatment more effective. This monitoring is of drugs where therapeutic index is low. Among antibiotics, it is frequently done with aminoglycosides and with certain cancer chemotherapy drugs. Prevention of diseases of infections by chemotherapy. E.g. in patients of rheumatic fever long acting penicillin is drug of choice for preventing recurrences. In meningococcal meningitis, ceftriaxone or Rifampicin is given during an epidemic. In malaria, person travelling to endemic area with high transmission rate, Mefloquine or Primaquine are given. Purpose of surgical chemoprophylaxis is to decrease the incidence of surgical site infections, to decrease the adverse effects of drugs with minimum alteration of microbial flora. Incidence of surgical infection is more where duration of surgery is 2 hours or more (prolonged surgery) or where there is insertion of prosthesis in bones or body cavities. Carrier state is the continuous presence of micro-organisms like bacteria, viruses or fungi in organisms without infecting that person or producing symptoms, but capable of infecting or transmitting it to other persons. E.g. meningococcal carrier states and typhoid fever carriers. 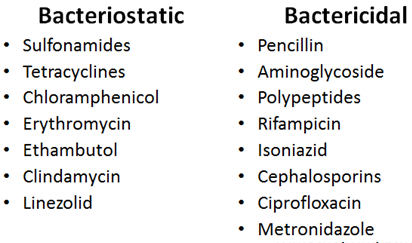 Bactericidal drugs that kill bacteria. Bacteriostatic drugs that only stop the growth of bacteria, not necessarily harming them otherwise. Upon removal of bacteriostatic drugs, growth of bacteria is resumed. Local irritation produced at site of administration e.g. pain and abscess formation by I/M drugs and thrombophlebitis of injected vein by I/V administration. Almost all antimicrobials produce this toxicity. It is mostly seen with erythromycin, tetracyclines and cephalosporins. Almost all antimicrobials produce dose related and predictable organ toxicity. E.g. with aminoglycosides ototoxicity and nephrotoxicity is seen, with tetracyclines, renal and hepatic toxicity occurs and with chloramphenicol bone marrow suppression is encountered. Practically all antimicrobials are capable of producing hypersensitivity reactions, ranging from skin rashes to anaphylactic shock. These might be unpredictable and not related to dose. Usually seen with penicillin and cephalosporins. Appearance of newer infection as a result of aminoglycosides since these drugs are capable of suppressing flora. It is seen with broad spectrum drugs. Individuals are compromised and situation is difficult to treat. With prolonged use of antimicrobial agents, vitamin B and vitamin K deficiency can occur. E.g. neomycin aminoglycoside can produce steatorrhoea and malabsorption syndrome. Aminoglycosides may be sufficient to treat one infection at same time mask another one acquired. One infection is treated at a time, as a result second infection manifests later in more severe form e.g. syphilis is masked by single dose of penicillin that is used to treat gonorrhea. Some microbes have always been resistant to aminoglycosides due to lack of target site on which they act, due to alteration in metabolic processes. E.g. Gram –ve bacilli are not affected by penicillin. Mycobacterium tuberculosis is not affected by tetracyclines. This type of resistance poses no significance clinically. Development of resistance due to use of aminoglycosides over a prolonged period of time. This is dependent upon the micro-organisms. Some bacteria are notorious for rapid acquisition of resistance like Staphylococcus aureus, coliforms and tubercle bacilli. Gonococci quickly develop resistance to suphonamides. They slowly develop resistance to penicillin. Drug resistance may be due to mutations and genes transfer. Stable, heritable genetic change that occurs spontaneously and randomly among micro-organisms and are not induced by antimicrobial agents. Any sensitive population of micro-organisms contain a few mutant cells which require a higher concentration of antimicrobial agents for inhibition. These cells are selectively preserved and get a chance to proliferate once sensitive cells are removed. This mutation may be single step or multiple steps. It emerges rapidly, confers a high degree of resistance e.g. the resistance to Rifampicin develops in a single step manner. In this a number of gene modifications are involved. Sensitivity decreases in a stepwise manner. Resistance to erythromycin is developed by this manner. Largely occurs in colon where a large number of gram negative bacilli come into contact. It is a very important mechanism of horizontal transfer of infection. Resistance properties are usually encoded in extra chromosomal “resistance factor”. Resistance factor is taken up by a phage and transferred to another bacteria. This transfer of resistance carrying gene through an agency of bacteriophage is called transduction. Infectious bacteria release the gene carrying resistance into a medium from where this is imbibed by another organism. E.g. the alteration in penicillin binding proteins (PBP) in methicillin resistant staphylococcus aureus. Decreased accumulation of antimicrobial agents due to decreased entry or due to efflux pumps. E.g. in gram negative bacilli there is lipopolysaccharide layer that prevents the entry of aminoglycosides. Presence of efflux pumps which pump the drug out of cells. It is seen with tetracyclines and primaquine. Certain enzymes produced by microorganisms tend to inactivate aminoglycosides. E.g. beta lactamases inactivate penicillin and cephalosporins. Acetyl transferrase converts chloramphenicol into inactive compound. This is development of tolerance or resistance to toxic substances as a result of exposure to similarly acting substances. It is usually seen with pesticides and antimicrobial agents. E.g. Rifampicin and Refabuten cross react in treatment of tuberculosis. This cross resistance is because they are chemically and mechanistically related. E.g. resistance to one sulfonamide means resistance to all sulphonamides. Resistance to one tetracycline means resistance to all other tetracyclines. Partial cross resistance is usually seen when drugs are unrelated. E.g. seen between chloramphenicol and tetracylines. No inadequately prolonged use of antimicrobial agents. Prefer rapidly acting & selective aminoglycosides whenever possible. Organisms notorious for resistance like staphylococcus aureus and E. coli should be treated intensively.